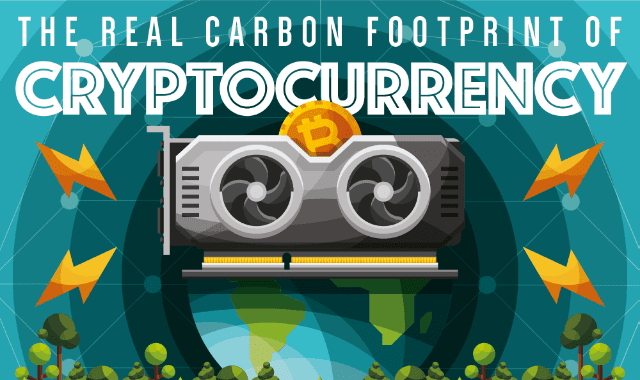 The Real Carbon Footprint of Cryptocurrency #Infographic ~ Visualistan '+g+"
Does cryptocurrency have an impending energy crisis? It depends on who you ask. Bitcoin is one of the worst energy offenders in the crypto space because of how it is designed. In order to be self-limiting every transaction comes with a harder problem for a computer to solve. When mining Bitcoin computers are competing to solve these problems as quickly as possible and the winning computer is awarded the Bitcoin. Unfortunately this takes a whole lot of energy, leading many to sound the alarms of the impending crypto energy crisis. The good news is that cryptocurrency is still new enough that we can head this off before it becomes a serious problem. Building new currencies going forward can be done with an eye on energy efficiency, and there are even some people who have bought land around the Tesla gigafactory, which could mean crypto could have a future in renewable resources. Learn more about the crypto energy crisis from this infographic.